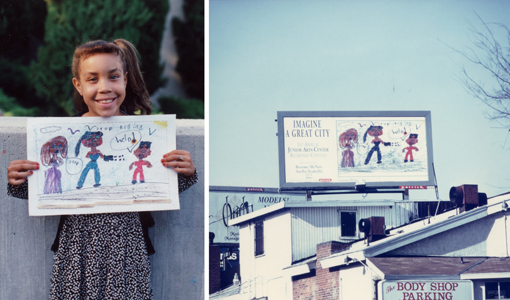 Imagine a Great City: Friends of the Junior Art Center Billboard Project. In its inaugural year, the Friends of the Junior Arts Center (FOJAC) Billboard Project suceeded in displaying the artwork of four Junior Arts Center students on twenty billboards located throughout Los Angeles. It also raised $7238 for the general fund on the total revenues of $17,080. This accomplishment established a strong precedent for what FOJAC plans to make into an annual event. What caputures the spirit of the Project best of all are the photographs of each sudent holding the original artwork mounted next to a photograph of the final billboard. These images serve as a powerful reminder not only of the sense of pride and accomplishment felt by each student but also of the significant contribution the Junior Arts Center makes to Los Angeles. Anthony Anella initiated and completed this project as a board member of FOJAC in Los Angeles. It was inspired by the "Art in the Open" billboard program in Albuquerque.